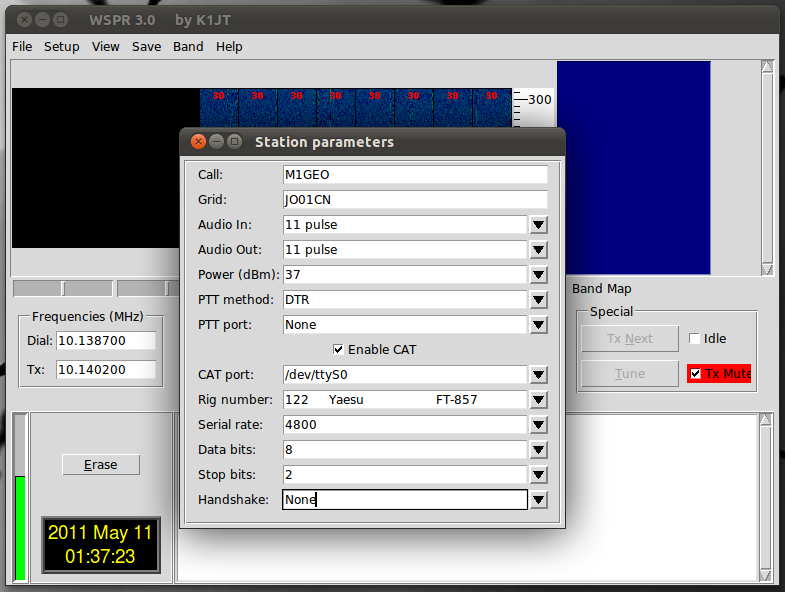 This page details how I compiled K1JT’s WSPR software on my amd64 Ubuntu 11.04 machine. It should work for 32-bit machines too. I decided to compile the code as opposed to using the provided Ubuntu DEB file, as the “–force-architecture” command didn’t work. This page has been updated for WSPR v4. There’s also a version of this page for Compiling WSPR-X! Last checked with Xubuntu 14.04 and WSPR revision 4224. If this page was useful, please consider Donating to me. To install these from the console, use the following. The “\” means the command continues on the next line, and should be removed. Once the above have installed, we can download the WSPR source code from SVN. I like to create a folder for it to all live in, while i work with it. Create a folder and ‘cd’ into it with the terminal. We can then use SVN to download the sourcecode. At the time of writing, this was revision 2225. Once it has downloaded, cd into the wspr directory again. With the addition of autoconf into the process, the task of configuring the build has been reduced somewhat. If you are interested in the old configure process, please look at this pages history (specifically from before 29 July 2014). Now, we run the autogen.sh script. The compilation throws a good few, warnings, skipping, etc, but at the end it finished with an error status of 0. Initially, I had some trouble getting WSPR to run. Aaron (VK3ABX) suggested that I recompile WSPR using f2py version 3 (since version 2 is detected by default). I edited the makefile, changing any reference to /usr/bin/f2py to /usr/bin/f2py3.4 in my case. A simple “make clean”, “make” and “sudo make install” solved the issue, and then we were away! And, with any luck, you’ll get the WSPR program up and running. As Griff (M0HWS) mentioned in an email to me, to use the CAT interface with the OS X build of WSPR requires putting the HamLib libraries, specifically the rigctl binary. I cannot remember the exact details for how I did this, but I can offer you my Application to download. It is based on WSPR 3.0 from NH6Z (as above) with the HamLib files added in by myself. Feel free to strip the hamlib and rigctl files from this package and add them to your own, or simply run my package (after changing the callsign, of course!). The files required are located inside the Package’s Resource folder: /WSPR.app/Contents/Resources/ It should be evident which files are hamlib as they all have that in their name. Don’t forget rigctl too. 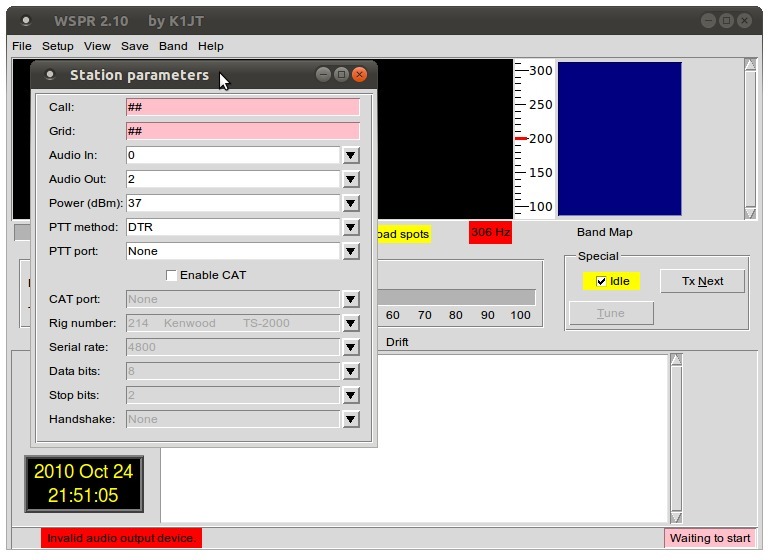 WSPR 3.0 with CAT Files Included (HamLib & RigCtl) (~10MB) TAR file includes WSPR.app which is an OS X compatible Application.